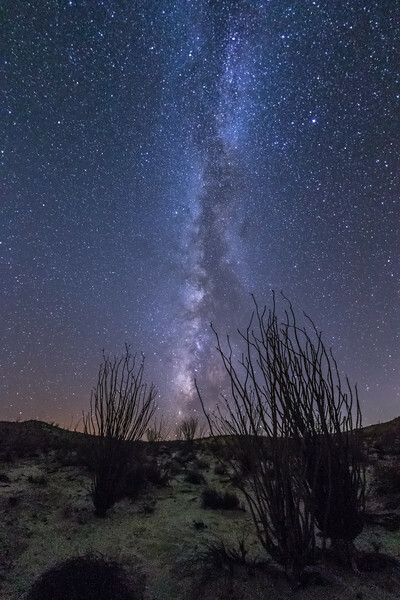 Some ocotillo and the Milky Way in Canyon Sin Nombre in southern Anza-Borrego Desert State Park. The ocotillo are definitely my favorite desert plant. I'll never forget the first time I drove through the Anza-Borrego Desert. The ocotillo look like aquatic plants at the bottom of a dried up ocean. Fouquieria splendens (commonly known as ocotillo American Spanish: [okoˈtiʝo], but also referred to as coachwhip, candlewood, slimwood, desert coral, Jacob's staff, Jacob cactus, and vine cactus) is a plant indigenous to the Sonoran Desert and Chihuahuan Desert in the Southwestern United States (southern California, southern Nevada, Arizona, New Mexico, western Texas), and northern Mexico (as far south as Hidalgo and Guerrero). Ocotillo is not a true cactus. For much of the year, the plant appears to be an arrangement of large spiny dead sticks, although closer examination reveals that the stems are partly green. With rainfall, the plant quickly becomes lush with small (2–4 cm), ovate leaves, which may remain for weeks or even months.